Winter Carnival at Tempe East Campus is a Success! | The Pinnacle P.O.V. Students from the Tempe East campus of Pinnacle Education circled around their instructor and waited intently for his next move. But they weren’t waiting for him to start his next lecture, or pass out an assignment. They were waiting for him to joust! Before you start throwing your hands up and rolling your eyes in disgust, there was a perfectly good reason for this to be happening. It was part of Pinnacle Education’s Winter Carnival. Faculty and staff at the Tempe East campus decided to put on the carnival to reward those students who performed well in their classes during the semester. 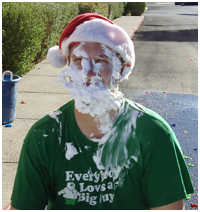 Dugan also expressed his appreciation by letting students throw pies and water balloons at him. When asked why he would “volunteer” and allow the students to do that, Dugan chuckled. “I got talked into it.” He said with a smile. The students who attended the event had a great time and Vince Mosca, a Pinnacle Personal and Career Exploration Instructor, hope the carnival promotes attendance and hard work for future semesters. Not only did Mosca help coordinate the event, he was probably the biggest attraction at the carnival. For those who were interested, Mosca challenged them to a game of inflatable jousting. Students, and even a couple staff members, tested their skills against Mosca. Overall, the event was a great success and everyone had an excellent time. Stay tuned to see if Mosca will defend his jousting title next year. ~ by pinnaclepov2224 on December 16, 2009.